<– crowd waiting to watch the DragonCon parade The best way to ease you into what the Saturday morning parade was like is to quote one of the bumpers from the DCTVprogramming last weekend "We have a parade that marches like Sherman through Atlanta." Now, although I recognize that Sherman’s march through Georgia – and through Atlanta in particular – was full of all sorts of horrible consequences, I can’t help but find that simile sort of amusing. Maybe it’s because I initially went through school for history. Maybe it’s because it’s such an odd thing to say to begin with. Or maybe, just maybe, because it’s so amazingly accurate a description. 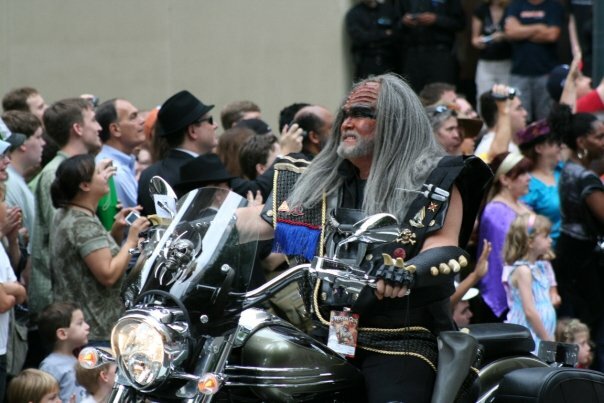 To be honest, it was seeing pictures of the DragonCon parade about two or three years ago that orginally got me interested in going to that particular convention. 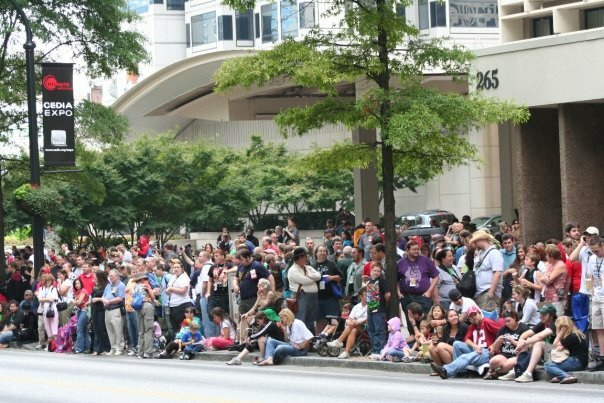 That’s right, I’ve been longing to check out DragonCon for a good long while. I could tell from the photos I had stumbled across online that the place was a mecca for costumers. Somewhere, way back in my head, that little voice that likes to think it has the best ideas in the world leaned forward, poked me in the brain, and said “Hey. Psst. You like costumes. You like watching parades. You should go to that. Nevermind that it’s in Atlanta and you have almost no money to your name.” The little booger never did stop jabbing my brain. Quite obviously, since I’m writing these con reports, I finally gave into the nagging. And I’m very glad I did. The parade was scheduled to begin at 10am on Saturday morning. Folks who were registered to march in the parade were supposed to meet and start lining up around 9:30. Since Maggie and I weren’t all that sure about how the parade was going to be handled, we wanted to get downtown and in to our sweet parking lot before the roads around the block of convention hotels were shut down. We dressed in our comfy Jedi jammies, drove downtown and parked. I was actually kind of surprised how many open parking spaces there still were at that point (I believe we got in around 9:15am). The parade route was supposed to head around uphill from our parking lot, so we made our way up the sidewalk. Even though the parade wouldn’t reach that section of the route for about another hour, the streets were completely packed. I mean PACKED. The cops hadn’t yet blocked off access to the street yet, so there were big crowds standing on all the streetcorners, waiting for the okay to stretch out across the street to watch. The crowd itself was a nice mix of people. I’d say about half were people who were attending the convention that weekend. The other half was made up with local Atlanta folks who came out in droves to check out the fun, festive environment. 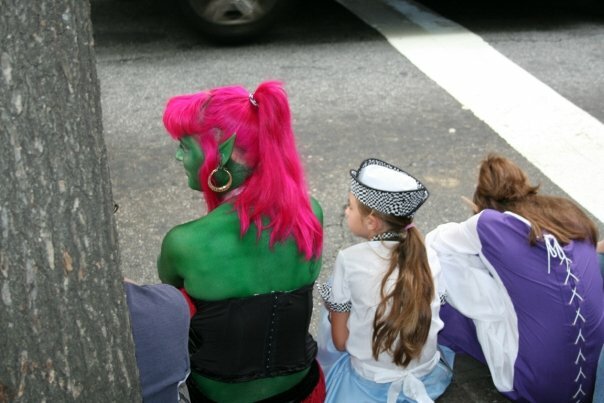 A lot of the parents who brought their kids out to see the parade dressed them up in sci-fi based costumes. It was a lovely opportunity for the kids to get dressed up in their costume finery and join in the fun. I happened to be standing next to a group that had two kids with them. One of the children was wearing a bounty hunter costume. It was easy to tell that the kid loved it…there were holes in the shoulders and other parts were wearing thin. The only problem with where I was standing was the oaf who was standing about three or four feet to my left. 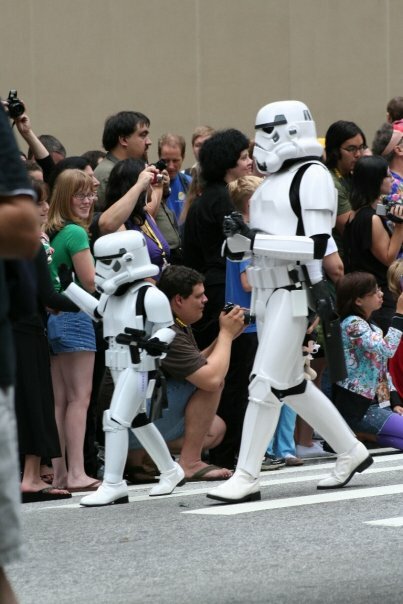 When the parade started he kept screaming “So-and-so, turn around. Come here!” While most people who dress in costume at a con are more than happy to goof off or pose for pictures, you don’t need to be barking orders at them. Especially not when you’re in a position where you’re essentially going to be yelling into the ears of the people in front of you. What really annoyed me about Sir Loud-Mouth, though, was the degrading way he’d talk about a lot of the women in the parade. Just because someone’s wearing an outfit that highlights that she’s a woman doesn’t mean you have to be obnoxious about it. It was kind of like the heckling you hear when a woman walks past a construction site. Apart from that one nitwit, the parade crowd was really rather good. 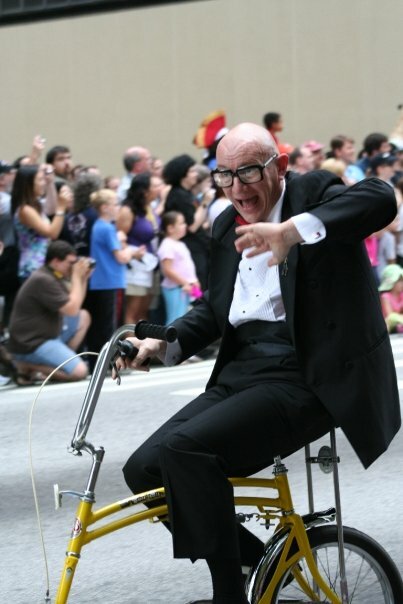 I’ve been to parades before where, despite clearly being the shortest person standing in the immediate vicinity and having staked out my place early in the day, I’ll wind up having tall folks barge in front of me and push me out of the way. That didn’t really happen here. As I mentioned, the parade was scheduled to begin at 10am. I’ve been to my share of parades and they rarely start exactly when they’re supposed to. I figured, with the sheer size of participants, there was no way that this one would start even close to on time. I was wrong. We were standing near the end of the parade route and the first group in the parade came down our section of the street not too long after 10. Naturally, everyone started cheering as they came into view. A contingent of cosplayers dressed as Colonial Marines, Predators and Aliens led the way down the road. I had met a couple of Colonial Marine cosplayers up at Polaris a few years ago but I didn’t realize until now how many people dress in those particular costumes. Apparently there are whole forums and discussion boards online where folks wanting to go all out and recreate those specific costumes can go to chat with other like-minded people. I knew that was the case with Dr. Who, Star Trek and Star Wars fandom but, sorry to say, I’m woefully undereducated about the many other groups who have what basically amounts to online symposiums about their respective cosplay sources. The parade was kind of broken up into different categories, each of which appeared to have even smaller subcategories. For instance, there was a huge Star Wars group that was broken up into stormtroopers, assorted bad guys (bounty hunters, Tuskan raiders, etc. ), Rebel Alliance peeps (not the marshmallow kind), followed by Jedi. I naturally cheered when the Jedi came down the street, as that is how I was dressed on that particular morning. 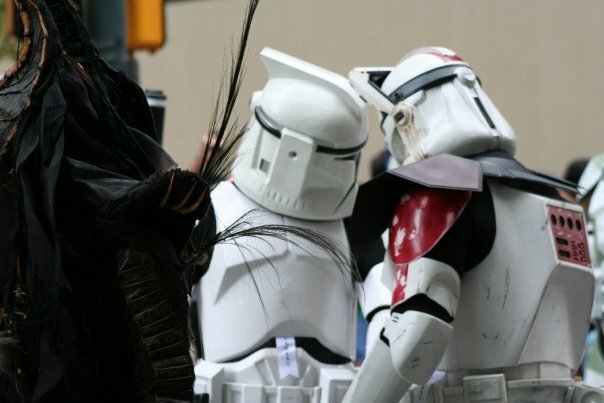 When I did my initial google search for DragonCon photos those many years ago, the first couple hits that popped up tended to be of the Star Wars group. Sitting through the parade (or, standing, rather) it’s easy to see why. There are just so many of them! Especially the stormtroopers! It’s really kind of astounding how many people have gone through the experience of creating their own stormtrooper armor. Although the major pieces are all the same, there will naturally be subtle differences. For example, I saw a few who were a little more…ahem…ample around the middle than you ever saw in the movies. I also saw a child dressed as a stormtrooper. I just thought that was adorable! The Sith Witch (the one in the place costume in the photo to the right) was one of the more impressive original costumes. As far as I know it’s not based on pre-existing designs of any character. I could be wrong though. There are a number of SW-based video games and I haven’t even come close to playing most of them. 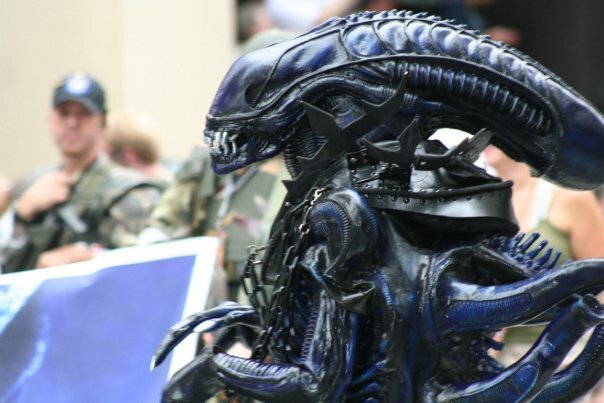 Even if it is based on a design for a game or film or whatever the costume remains an impressive example of worksmanship. 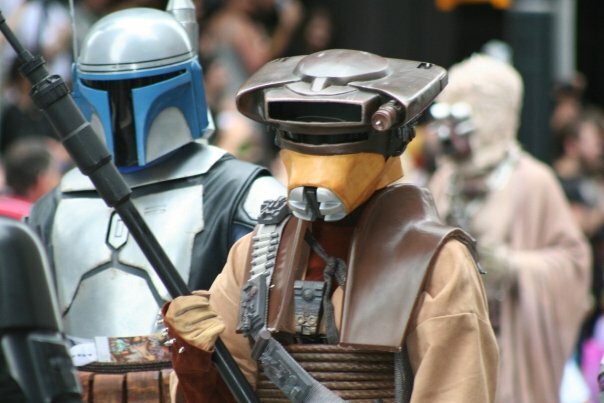 One of my favorite groups within the Star Wars section of the parade were the cardboard costumes. 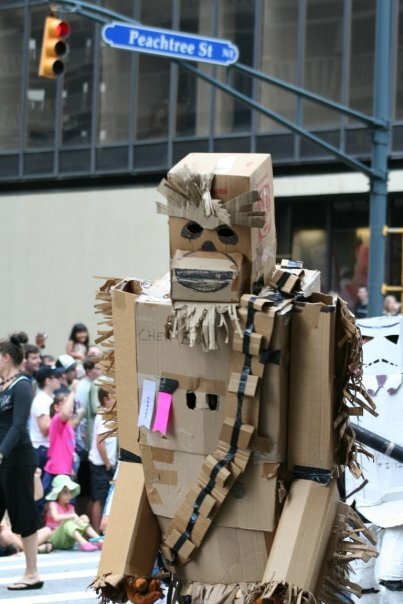 I don’t know who originally came up with the idea of making the Star Wars costumes out of cardboard but whoever did, it was a brilliant idea. It’s kind of the perfect medium for a costume that stands out. They can be simple or more elaborate, but they all end up being pretty cheap. All you really need is cardboard boxes, tape and markers and voila! A perfectly usable costume. 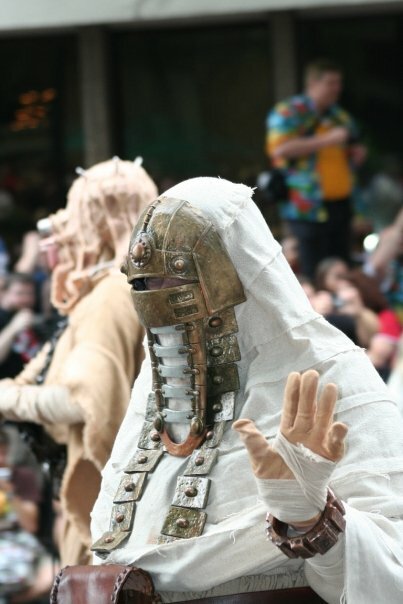 I usually tend to see cardboard box stormtroopers when I look at pictures of this type of costuming. 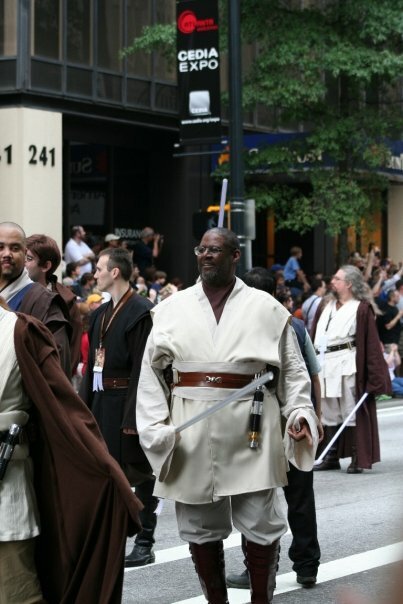 The DragonCon parade included a much larger cross-section, though. For instance, there was a cardboard wookie. I didn’t see it during the actual parade. I’m pretty sure I was paying attention to the antics of other cardboard box people at the time. Luckily, Maggie happened to get a picture of him. In case you’re wondering what’s going on in this picture, one of the stormtroopers was having issues with part of his shoulder armor as he passed our section of the street. One of the other stormtroopers tried to help him but, as you might have guessed, it’s not too terribly easy for them to put things back on themselves quickly. They grabbed one of the handlers that was marching with them and he helped strap the armor back on. 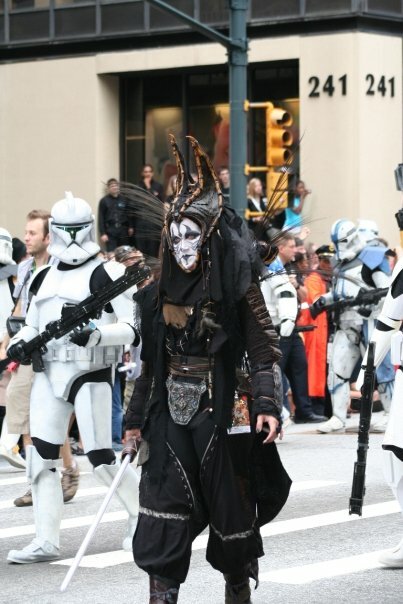 It really was pretty cool to see so many people inject a little bit of whimsy into their Star Wars costumes. 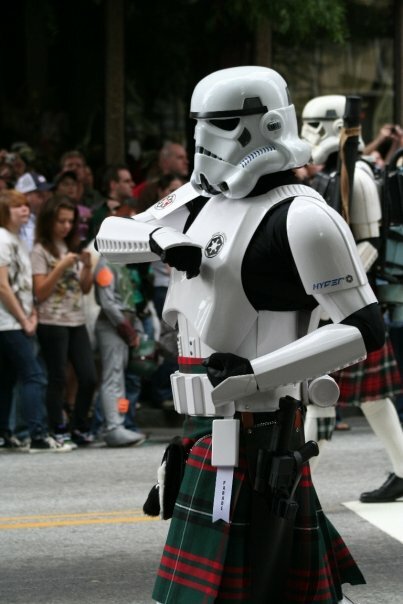 For instance, there was a group of kilted stormtroopers. I kind of wish I could give the person who had that idea a big kiss. Why? 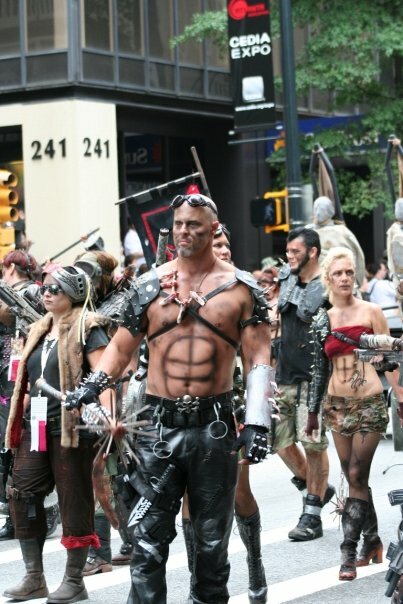 Well, guys who are willing to go all out with their costumes are cool enough. Guys who are going to dress in costume and wear a kilt? So hot! Speaking of hot…I’m sure these guys weren’t simply because it’s hard to feel overdressed when you’re basically wearing a pair of leather underoos. And a cape. Can’t forget about the cape. But other than those two things, they obviously weren’t wearing anything that might keep them warm in the event of a freak snowstorm. Good thing we were in Atlanta at the end of the summer, then, huh? 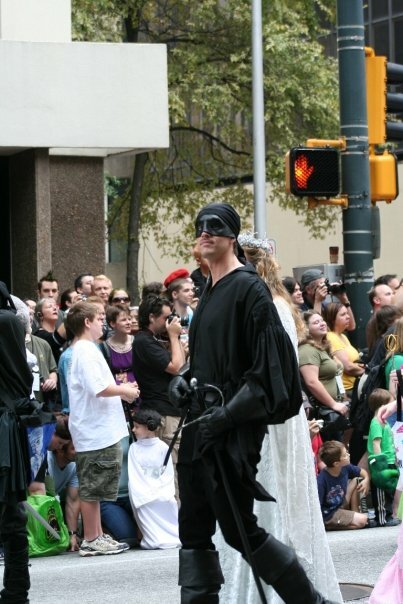 There was a moment while looking back through Maggie’s photos of the parade that I thought to myself “Huh…I don’t remember Cary Elwes being a guest at DragonCon.” Then I took a second look at the picture and realized that it wasn’t actually the original Wesley. Pretty darn good look-alike, though, right? 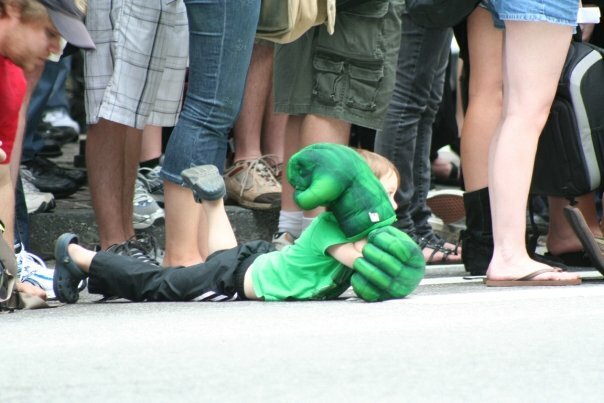 There was a big group of folks who marched in the parade dressed as superheroes. Naturally there was a high presence of people dressed in lycra and spandex who really could have gone without dressing in those materials. That’s one of the cool things about the convention, though. Even though certain costumes are easier to pull off when you look a certain way, I didn’t hear a whole lot of mocking as far as costume choice went. 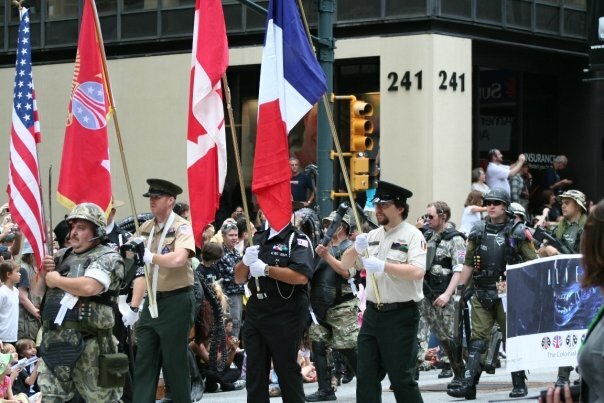 The parade – and, indeed, the convention as a whole – appeared to be made up of a number of people who were remarkably secure with their body image. Huzzahs! There were a lot of X-Men. Some were in movie-version costumes, others in costumes that were closer to those in the comics and the cartoons. Maggie and I saw a number of movie version Wolverines, for which I was extremely grateful. In my opinion, the movie costumes for Wolverine are some of the nicest things to see guys wearing. That and steampunk. ::innocent look:: There were a lot of Supermans and Batmans. I only recall seeing one Flash. It would have been funny if there were about four Flashes, all walking in a straight line. Sorry…that’s kind of an obscure Big Bang Theory reference. 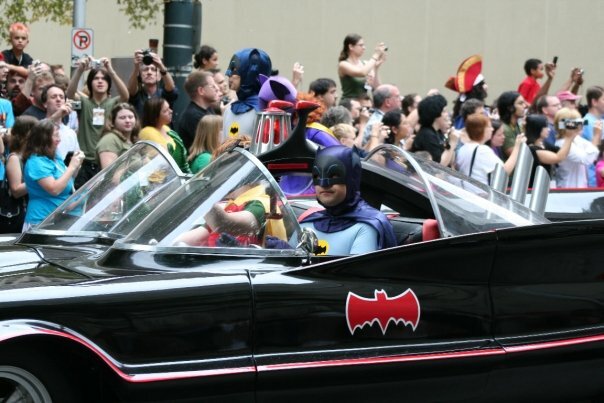 Apparently the Batmobile is a regular sight in the DragonCon parade. I was glad to see that the driver participated again this year. I kind of wish I had gotten the chance to sit in it. One of the largest groups in the parade can be described simply under the category “Horror.” I think they might have been the largest genre group in the entire parade. It was peopled (haha) by monsters, zombies, and goodness knows what else. There were a number of costumes that didn’t remind me of a particular movie or tv show or game. I’m sure they were simply in reference to some horror something-or-other that I haven’t encountered. Honestly? I’m not really a big fan of all-out horror films. I’m much more entertained by suspense than slasher films and the like. By the way, when I saved the above picture on my computer I titled it “creepy thing that makes me want to cry and pee my pants.” I know it’s from Silent Hill and I’m sure it has an actual name, but I think my title is much more descriptive. That being said, there were a number of wonderful costumes even in this category. I classified things as “good” in this group if they made me cringe or want to hide under a blanket. Or run, screaming, down the street. Take the thing in this photo to the left here. I have no idea what it is, but it kind of makes me want to throw up. 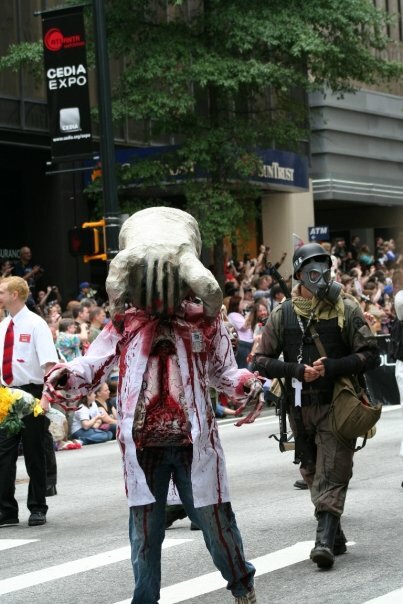 I would say that could be classified as a costuming win, as far as this category goes. There had been a big Middle Earth group in the parade near the beginning but it was made up primarily of the “good” characters and creatures. The orcs, goblins, Uruk-Hai, Sauron, etc. all came later. That’s where I saw this guy (to the right). He had some of the best makeup. I’m pretty sure the entire head is a prostethic. 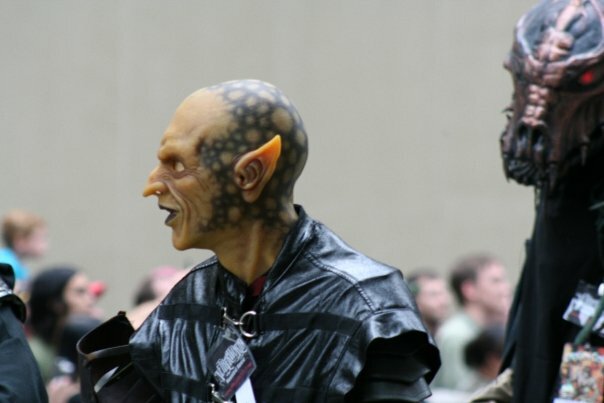 Wonderful version of a regular Middle Earth orc! The group that seemed to excite Maggie the most (apart from the Spartans which I think, quite honestly, excited most people in the audience) was the one representing the Mad Max movies. I didn’t actually recognize what exactly they were from until I saw the person dressed up like Tina Turner in the movie. That’s probably because I didn’t grow up with those movies like Maggie did. Yep. You heard right. Her favorite movie growing up was the Mad Max films. I think that goes a long way towards explaining her character. I was much more likely to watch stuff like Police Academy or Harry and the Hendersons. Well, and Jaws, but that’s because of my parents and, in my defense, for the longest time I just thought it was a movie about three guys and a shark. I didn’t actually realize the shark was eating people (thanks Mom, for “editing” out the scary bits). Anyway…getting off topic. 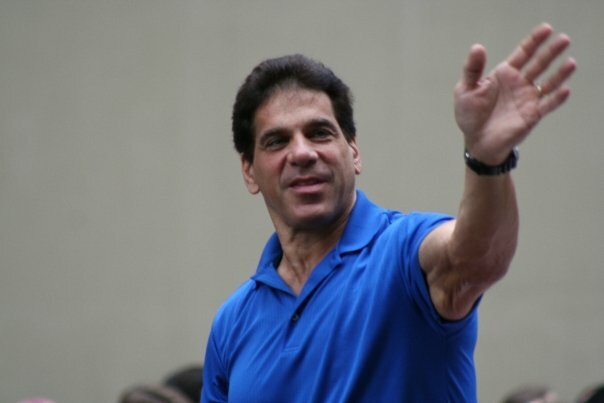 Before we came down for the convention I had done a little bit of research – well, maybe not a little bit – about groups that would be marching in this year’s parade. One of the things I came across was a note about signing up to be part of a specific group. The guy in charge of this subgroup was attempting to get enough people to march in the parade to represent the entire periodic table. I really wanted to participate in that group but I ended up opting to watch the parade this year. I did cheer extraordinarily loud when I saw them come down the street, though. After my shout of “Yeah! 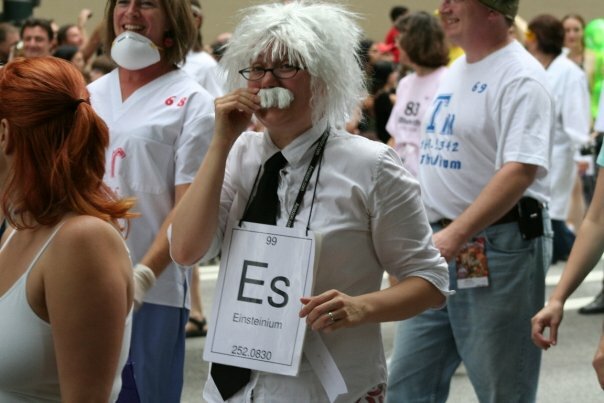 Periodic table!” people around me chuckled. I think the guy standing next to me didn’t get it until I said something. I thought it was brilliant. And the person who chose Einstienium was hilarious. About 45 minutes after it started, the parade drew to a close. Maggie and I stood around for a few minutes while the crowd started to dissipate. As I mentioned earlier a lot of people in the crowd were dressed in costume as well and there was a fair amount of photo ops taking place in various places along the parade route. There was a small water feature outside the Suntrust building, down the street from where Maggie and I had been standing. It was a nice little plaza, with a kind of ampitheatre type feel. 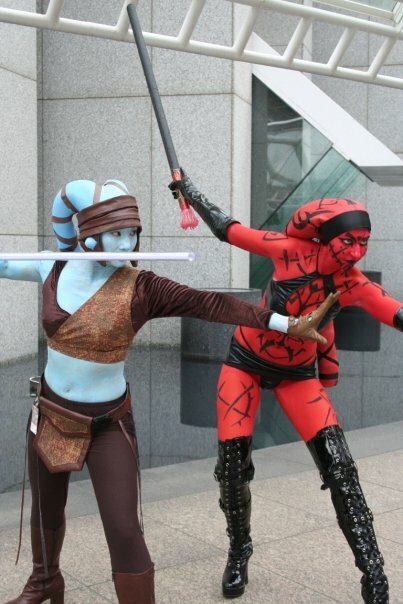 Two women dressed in Star Wars costumes – one Sith, one Jedi – were posing for pictures over near the water. From what I could tell of their conversation as people finished taking pictures they weren’t acquainted with each other prior to their impromptu photo shoot. I believe the one in red had asked the one in blue to pose for a picture of their own, and everyone else rushed over to take advantage of the two of them being positioned together. That’s the kind of thing that seemed to be going on all weekend. You’d be walking along and stop to take someone’s picture, and then along would come another person and ask if you and the other complete stranger would mind posing together for some pictures. Since I didn’t have my camera on me that day…well, actually, that’s not true. I had the camera. I had just forgotten the discs for the camera. Anyway, because I wasn’t equipped to take pictures I found myself directing Maggie to get certain people we passed. Occasionally I’d use my cell phone to snap a picture (thank goodness for camera phones!) but Maggie’s camera clearly has the better resolution. On our way into the Marriot following the parade, Maggie spotted this woman dressed as a Go’uld (I’m sure I’ve misspelled that) from Stargate. She even had a little battery-pack thingummy in her bracelet that was hooked up to her headpiece. When she hit the switch, it made her eyes glow, just like in the movie and tv series. Next up, Day Two’s activities and NGB costume awards (that’s “Nerf Gun Bobbins,” in case you were confused). For now, I’ll leave you with a nice little image.